Species : Cleome rutidospermae D.C.
Upright herbaceous, creeping or crawling grow tall 0.15-0,80 m, flowering throughout the year. 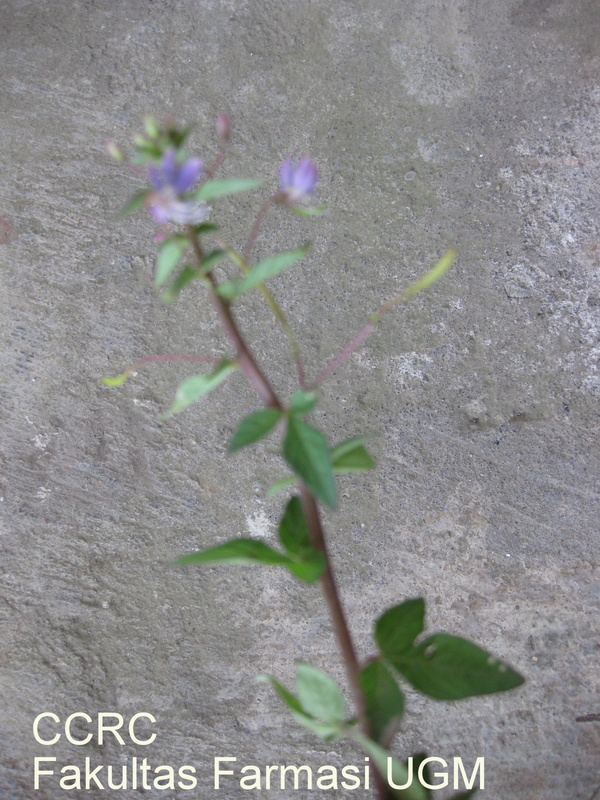 Flower petals with a pointed end like a claw, 9-12 mm long; in Java the color is blue; fine hairs are short; fruit stalk 20-30 mm; rods (shaped capsule) which is above the cook leaves scratches gradually tapered beak-like; 1.75 to 2 mm diameter seeds, elaiosom whitish; leaf blade usually 3, elongated or rounded leaves form elongated, sharp or blunt, with short thick hairs; stem 0.5-2 cm with thin spines. Known as Maman purple, or, Maman man (Waterhouse & Mitchell, 1998). Found on the side of the road, fields, farm. Also found life as epiphytes on stone and wood. Mainly found in Borneo (Waterhouse & Mitchell, 1998). Capparaceae family members containing tioglukosida (known as glucosinolates) that releases isothiocyanate (oil evaporate) if the plant is destroyed. Besides this plant also contains alkaloids and flavonoids which kind yet known (Mitchell et al.,2003). Literature and scientific studies regarding the efficacy of Cleome rutidosperma DC is still very limited and the compounds responsible for the activity is not known with certainty. Cleome rutidosperma can be used as an antifeedant (substitute herbicides) for Brassica crops are pest species, Plutella xylostella (L.). The evaporation of the oil has activity can irritate the skin and may also contact allergenic activity (Mitchell et al.,2003). Although it has not been widely studied, but in fact it contains a class of potential anticancer compounds, such as alkaloids and flavonoids, both of which are potentially as negative regulators of oncogenes (cell cycle regulatory genes group) and tumor suppressor gene positive regulator, so that potential as anti-cancer (Shapiro and Harper, 1999). Negative regulation of oncogenes will stop the proliferation of cancer cells in a specific phase of the cell cycle. As tumor suppressor genes, such as p53 and protein Retinoblastoma protein (PRB). Rb protein is able to bind to E2F proteins (replication factor), so that the cell cycle would be inhibited (Gibbs, 2000). For example alkaloids, on the vinca (Chatarathus roseus (L.) G. Don) were able to stop the cancer cells in metaphase of mitosis (Irna, 2001). While flavonoids can induce apoptosis through inhibition of the activity of DNA Topoisomerase I / II, a decrease in ROS (Reactive Oxygen Species), release of cytochrome C, endonuclease activation and decreased Mcl 1pelepasan cytochrome C, endonuclease activation and decreased Mcl 1. The mechanism of antiproliferative flavonoids as cancer cells can also be through inactivation of carcinogenic compounds (related to the interaction between flavonoids with enzymes involved in metabolism, such as S-transferase enzyme Gluthation), inhibit angiogenesis and as an antioxidant (Pan et al., 2003). This Capparaceae familia members also contain glucosinolates and product degradation, isothiocyanate (Mitchell et al.,2003). Glucosinolates could stimulate the activity of antioxidants and detoxification mechanisms. While isothiocyanates can inhibit tumor growth and cancer progression. From the research, the American Health Foundation, about the effect of the consumption of broccoli containing isothiocyanate for 11 years, known to those who consume less broccoli lung cancer risk 36 percent higher (Anonim, 2003). Backer, C.A., and Van Den Brink, R.C.B., 1965, Flora of Java (Spermatophytes Only), Vol II., N.V.D. Noordhoff-Groningen-The Netherlands. Gibbs, J.B., 2000, Anticancer drug targets: growth factors and growth factor signaling, J. Clin. Inves, 105 (1): 9-13. Irna, 2001, Tanaman Obat untuk Penderita Kanker, diambil dari http://pdpersi.co.id/, diakses pada Desember 2005. Pan, M. H., Chen, W. J., Lin-Shiau, S., Ho. C. H., Lin, J. K., 2002, Tangeretin Induces Cell Cycle Through Inhibiting Cyclin dependent Kinase 2 and 4 Activities as Well as Elevating CDK Inhibitor p21 in Human Colorectal Carcinoma Cells, Carcinogenes, Oxford University Press, 23, 1677-1684. Shapiro, GI., and Harper, JW., 1999, Anticancer drug targets: cell cycle and checkpoint control, J. Clin. Inves, 104 (12) : 1645-1653. Mitchell, Mitchell & Jordan, & Richter, 1974, Capparaceae (Caper Family), diambil dari http://bodd.cf.ac.uk/BotdermFolder/BotDermC/CAPP.html, diakses Desember 2005. Waterhouse, B. M, and A. A. Mitchell, 1998, Northern Australia Quarantine Strategy: Weeds target list, second edition, Australian Quarantine and Inspection Service, Misc. Pub., Australia, 29-30.